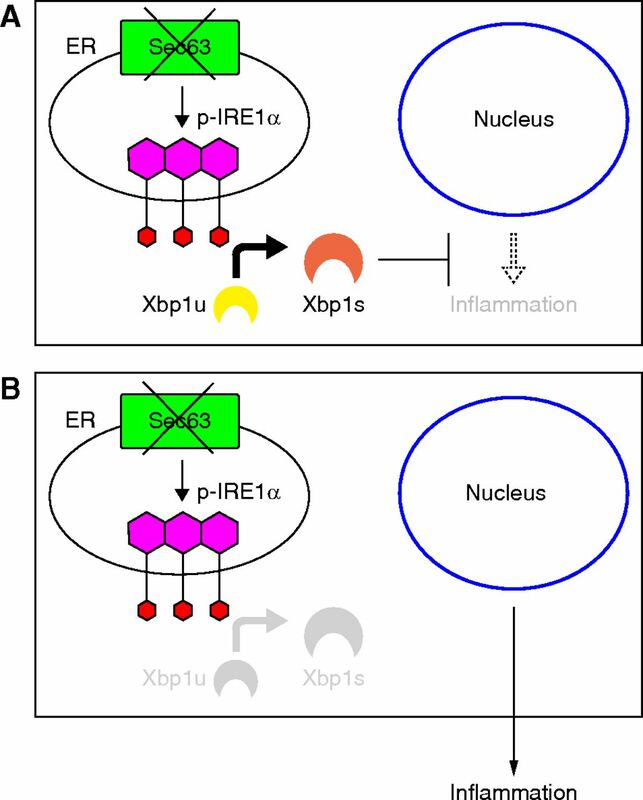 Inactivation of Sec63 and Xbp1 results in renal interstitial inflammation. (A) Hematoxylin and eosin staining and (B) Masson trichrome staining of renal cortex and medulla of the indicated genotypes at P70. WT and Sec63 mutant (SKO) kidneys do not show interstitial inflammation or fibrosis. 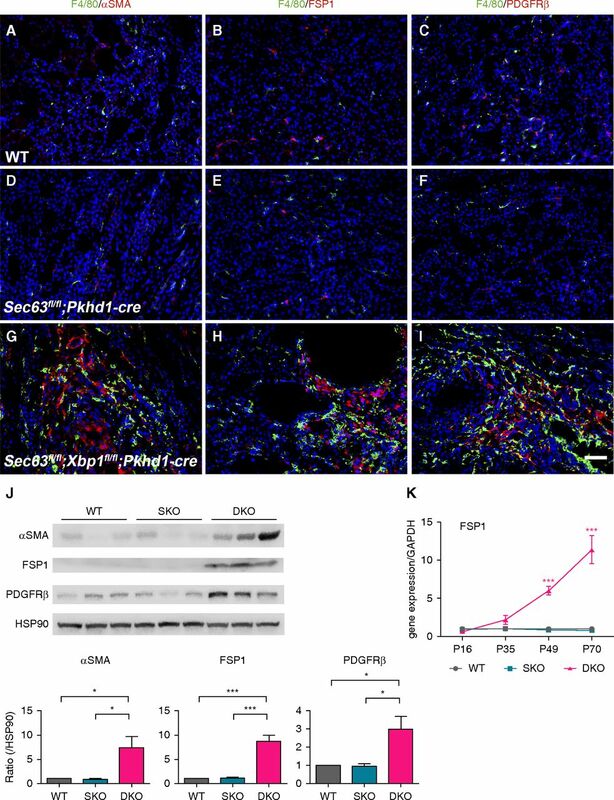 Sec63 and Xbp1 double mutants (DKO) have extensive inflammatory infiltrates and areas of collagen deposition. Scale bar, 500 µm. (C) Quantitative assessment of body weight (body wt), percent two-kidney weight to body weight ratio (%KW/body wt), BUN, and serum creatinine (s-Cr). Kidney function indicated by BUN and s-Cr begins to decline by P49 in DKO kidneys. The colors correspond to the genotypes in (A). Results are shown as mean ± SEM (ANOVA among groups at each time point). ***P<0.001; **P<0.01; *P<0.05. Macrophage infiltrates in kidneys with dual inactivation of Sec63 and Xbp1. (A–I) Immunocytochemical analysis of (A–C) WT, (D–F) SKO, and (G–I) DKO kidneys at P35. (A, D, and G) show macrophages (F4/80; red) and proximal tubules (LTL; green); (B, E, and H) macrophages (red) and thick ascending limbs of the loop of Henle (Tamm–Horsfall protein [THP]; green); and (C, F, and I) macrophages (red) and collecting duct (Dolichos biflorus agglutinin [DBA]; green) in the outer medulla. (G–I) The macrophage infiltrates are much more prominent in DKO kidneys. (H) The inflamed DKO mTAL contains urinary THP casts (arrows). (I) Macrophages are found infiltrating around the collecting duct tubules (“tubulitis”; arrowheads). Nuclei are labeled with Hoechst, blue. Scale bar, 50 µm. (J) Gene transcript expression by quantitative RT-PCR for F4/80 and monocyte chemoattractant protein 1 (MCP1) indicates significantly increased mRNA levels in DKO kidneys compared with WT and SKO beginning at P35 (F4/80, n=3 and MCP1, n=6 at each time point for each genotype). Results are shown as mean ± SEM (ANOVA). ***P<0.001; **P<0.01; *P<0.05. (K) mRNA expression of iNOS is significantly increased in DKO at P49 and P70. Gene expression of Arg1 begins to increase at P49 and is significantly increased at P70. n=3 for each time point; results are shown as mean ± SEM (ANOVA). ***P<0.001; **P<0.01 compared with both WT and SKO. Myofibroblasts coexist with macrophages in the kidneys of mice of double inactivation with Sec63 and Xbp1. (A–I) Immunocytochemical analysis of F4/80 (green) and (A, D, and G) α-smooth muscle actin (αSMA; red), (B, E, and H) FSP1 (red), and (C, F, and I) PDGFRβ (red) in kidneys with the indicated genotypes at P49. (G) αSMA-positive, (H) FSP1-positive, and (I) PDGFRβ-positive fibroblasts coexist with macrophages in DKO kidneys. Nuclei are labeled with Hoechst, blue. Scale bar, 50 µm. (J) Representative immunoblots (top) and aggregate densitometric quantification from kidney lysates (bottom) show that levels of αSMA, FSP1, and PDGFRβ are significantly increased in DKO compared with WT and SKO kidneys at P49. Densitometry is normalized to HSP90, which serves as loading control. n=3 per genotype; results are shown as mean ± SEM (ANOVA). ***P<0.001; *P<0.05. (K) Time course for mRNA expression level by quantitative RT-PCR of FSP1 shows significantly increased levels of transcripts in DKO kidneys at P49 and P70. n=3 at each time point for each genotype; results are shown as mean ± SEM (ANOVA). ***P<0.001. Absence of activation of the Ire1α/Xbp1 branch of UPR after collecting duct selective inactivation of Sec63. (A) Xbp1 mRNA splicing (Xbp1s) is absent in WT, Sec63fl/fl;Pkhd1-cre (SKO), and Sec63fl/fl;Xbp1fl/fl;Pkhd1-cre (DKO) whole kidney mRNA by RT-PCR. Tunicamycin (Tun) serves as positive control. (B) mRNA expression of Xbp1s by quantitative RT-PCR indicates no difference among WT, SKO, and DKO kidneys at P35 (n=5 samples per genotype). Results are shown as mean ± SEM (ANOVA). (C) Gene expression of the canonical Xbp1 target ERdj4 is also not different among WT, SKO, and DKO kidneys at P35 (n=3 samples per genotype). Results are shown as mean ± SEM (ANOVA). (D) Ire1α activation examined by immunoblotting analysis using Phos-Tag electrophoresis to separate phosphorylated Ire1α (p-Ire1α) from the unphosphorylated form in P35 kidney lysates increased p-Ire1α in DKO kidneys, but not in WT and SKO lysates. Tun serves as positive control. (E) Immunocytochemical analysis of WT kidney at P35. 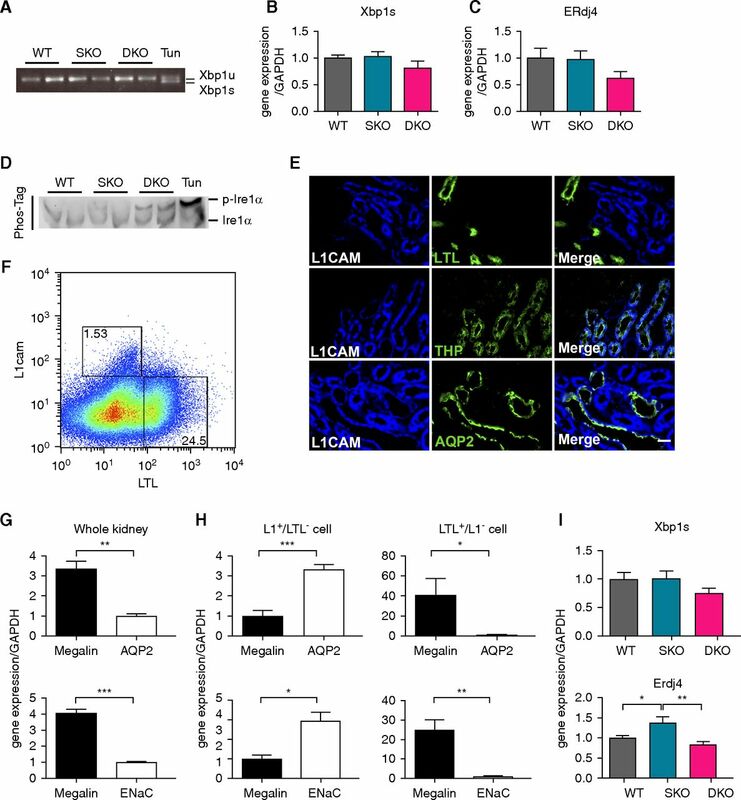 L1CAM recognizes Tamm–Horsfall protein (THP)- and AQP2-positive cells but not LTL-positive cells. Scale bar, 25 µm. (F) Gating for selecting L1(+), LTL(−) cells and LTL(+), L1(−) cells from dissociated SKO kidneys for RNA isolation. (G) Quantitative RT-PCR showing relative expression of megalin and AQP2, and of megalin and ENaC from WT P35 whole kidneys. Expression of AQP2 and ENaC arbitrarily set at 1. Results are shown as mean ± SEM (two-tailed t test). n=3; **P<0.01; ***P<0.001. (H) Quantitative RT-PCR of megalin and AQP2, and of megalin and ENaC in L1(+), LTL(−) cells and LTL(+), L1(−) cells of dissociated WT kidneys at P35. Expression of megalin in L1(+), LTL(−) cells is arbitrarily set at 1; expression of AQP2 and ENaC in LTL(+), L1(−) cells is arbitrarily set at 1. Results are shown as mean ± SEM (two-tailed t test). n=3; ***P<0.001; **P<0.01; *P<0.05. (I) Quantitative RT-PCR showing Xbp1s and ERdj4 in L1(+), LTL(−) cells from WT, SKO, and DKO kidneys at P35. Xbp1s is unchanged among genotypes. ERdj4 is increased in LTL(+), L1(−) cells from SKO kidneys. Results are shown as mean ± SEM (ANOVA). n=3 per genotype; **P<0.01; *P<0.05. Sec63 and IRE1α are present in a complex. (A) Schematic representation of IRE1α-HA construct. Two copies of HA tags and a PreScission Protease cleavage site were fused to the C-terminal of human IRE1α. (B) Xbp1 mRNA splicing by tunicamycin treatment in Ire1α-deficient MEF cells reconstituted with IRE1α-HA. (C) Lysates of Ire1α−/− MEFs stably transfected with IRE1α-HA or empty vector were subjected to affinity purification using anti-HA (3F10)-agarose matrix. IRE1α was eluted from the matrix using PreScission Protease. IRE1α and two proteins copurified by immunoprecipitation were revealed by silver staining and subsequently identified by mass spectrometry. *PreScission Protease. (D) Immunoblot analysis of anti-HA immunoprecipitate prepared from Ire1α−/− MEF cells stably expressing IRE1α-HA or empty vector showing coimmunoprecipitation of endogenous Sec63 and BiP. Bottom panel shows Sec63 immunoblot of lysates. 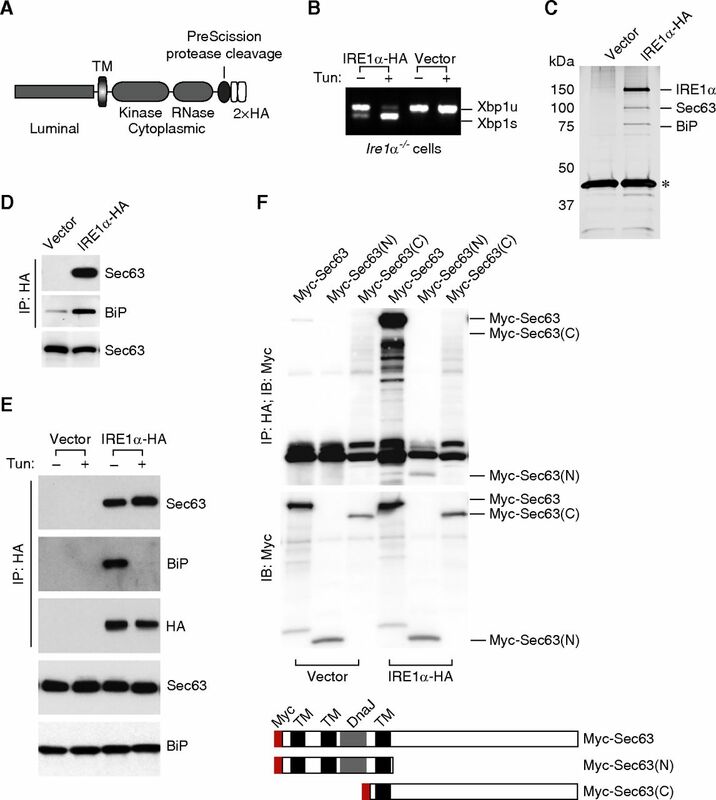 (E) Activation of UPR by tunicamycin does not dissociate the IRE1α-Sec63 complex. Mock- or IRE1α-HA reconstituted Ire1α−/− MEF cells were treated with tunicamycin (2 µg/ml for 2 hours) and subjected to coimmunoprecipitation analysis. Sec63, but not BiP, remains associated with IRE1α after tunicamycin treatment. Bottom two panels are immunoblots of lysates from the starting material. (F) The DnaJ domain is required for interaction between IRE1α and Sec63. HEK293 cells were transfected with indicated pairs of/plasmids. Immunoprecipitated samples were subjected to immunoblotting (top panel). Only Sec63 constructs that include the DnaJ domain coimmunoprecipitate with IRE1α. Middle panel shows immunoblotting of cell lysates to control for protein expression. Bottom panel shows schematic representation of Sec63 expression plasmids. Xbp1s is essential to suppress renal interstitial inflammation and fibrosis in kidneys with inactivation of Sec63. (A) Hematoxylin and eosin (H&E) staining of renal cortex and medulla of the indicated genotypes at P70 showing chronic kidney injury both DKOs and the triple knockout. Scale bar, 500 µm. (B) H&E staining of renal cortex and medulla of the indicated genotypes at P70 showing rescue of chronic kidney injury in both DKOs with transgenic re-expression of XBP1s. Scale bar, 500 µm. (C) Quantitative assessment of BUN and serum creatinine (s-Cr). The colors of the symbols correspond to the colors indicated for each of the genotype from (A and B). 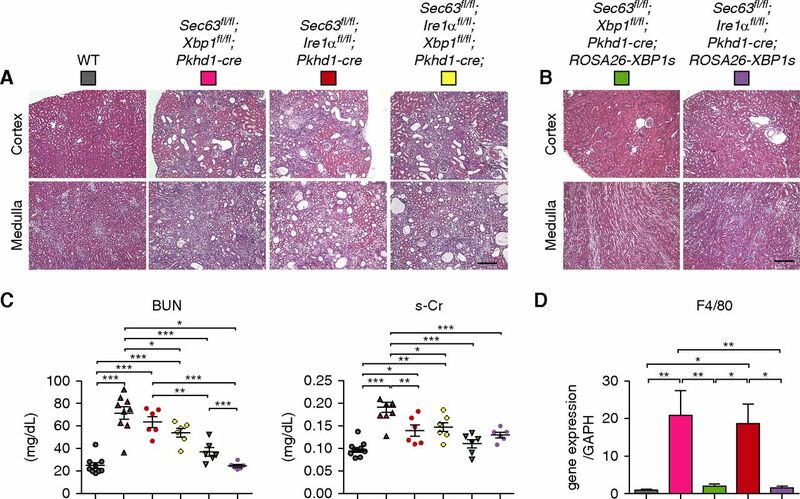 BUN and s-Cr indicate that Sec63-Xbp1 and Sec63-Ire1α as well as the triple knockout have impaired kidney function at P70. This impaired kidney function is resolved by re-expression of XBP1s on either DKO background. Results are shown as mean ± SEM (ANOVA). ***P<0.001; **P<0.01; *P<0.05. (D) Gene expression of F4/80 indicate that both DKO models have elevated levels that are resolved by re-expression of XBP1s. The color of the bars defines the genotypes on the basis of (A and B). Results are shown as mean ± SEM (ANOVA). n=3 mice for group; **P<0.01; *P<0.05. Schematic diagram depicting the interaction among Sec63, Ire1alpha, and Xbp1. (A) Xbp1 compensates for loss of Sec63 and prevents inflammation. 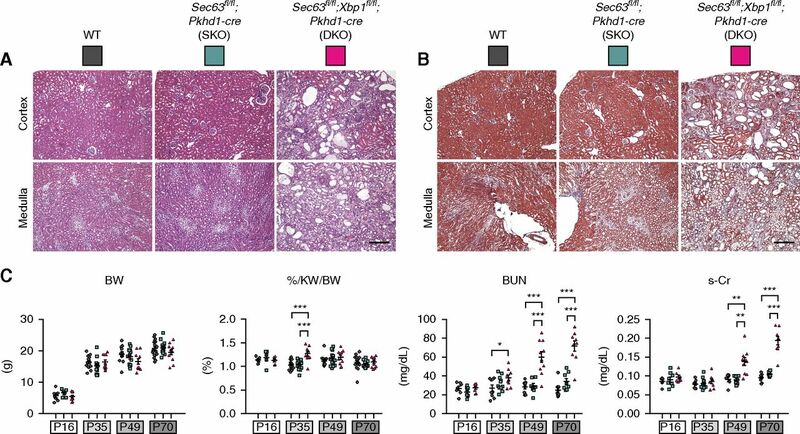 (B) Dual loss of Sec63 and Xbp1 promotes renal interstitial inflammation.